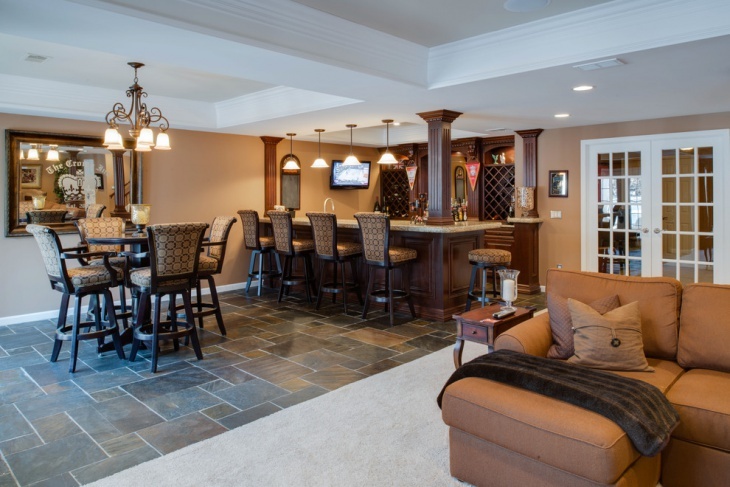 A cozy and a private home bar is a great addition to your house if you’re looking for some “man cave” and the kind of fun and entertainment that a fancy bar offers. 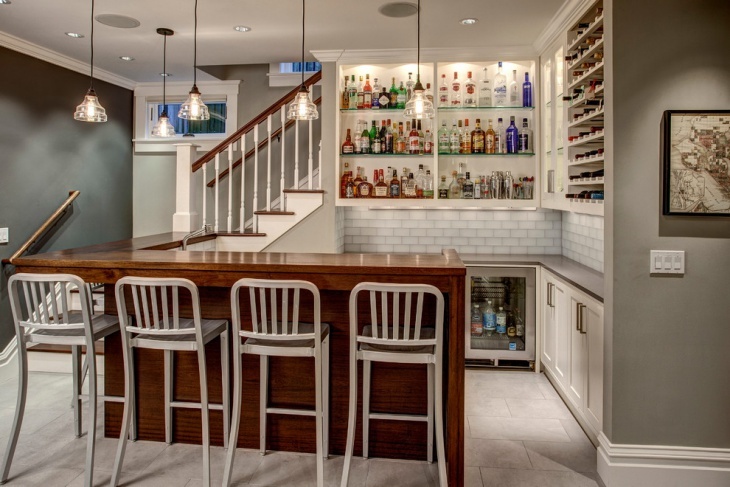 These home bar designs offer you with the right solution to make sure you get the drink at the right time. 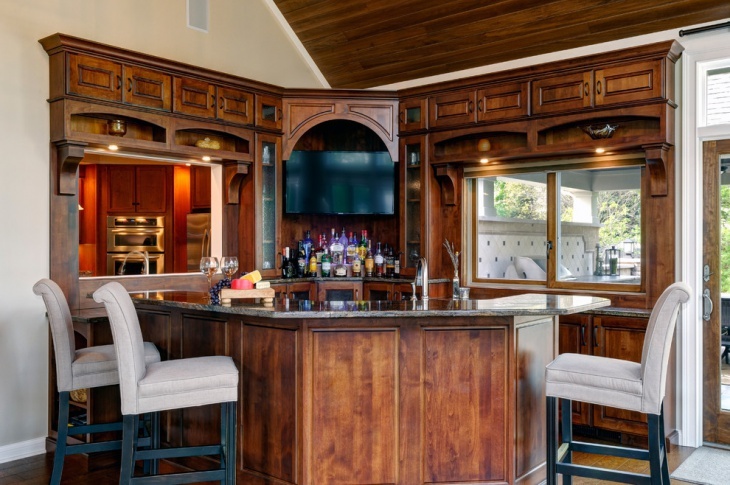 With such beautiful designs in your own house, you could invite your friends and acquaintances to your house and enjoy a drink in your very own customized home bar! 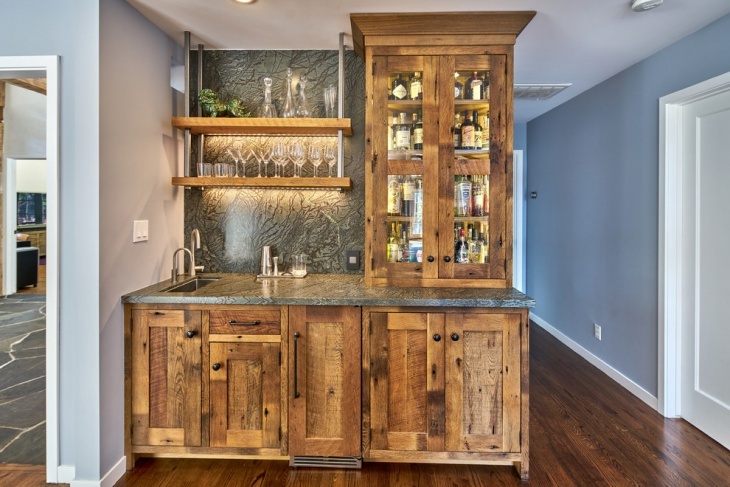 If you want a cozy place to enjoy your drink with your buds after a hard, tiring day at work, then you should consider building a small yet functional home bar inside your house. 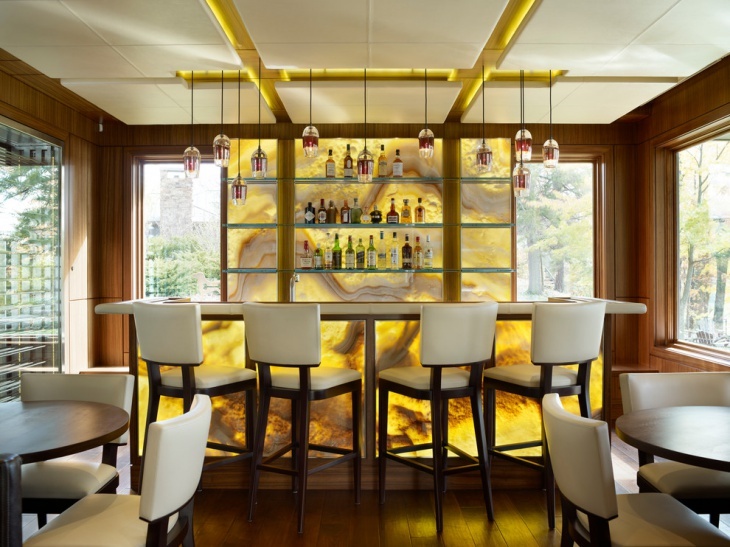 The designs are numerous and you could consider a stone encased bar which will bring out a rustic appeal to your bar. 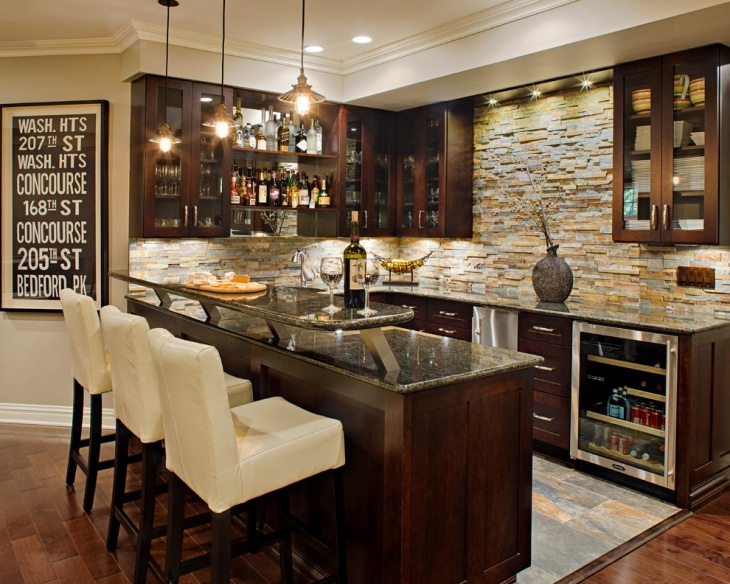 We talked about stone wall bar above, but if your taste is more modern you should make a compact home bar. 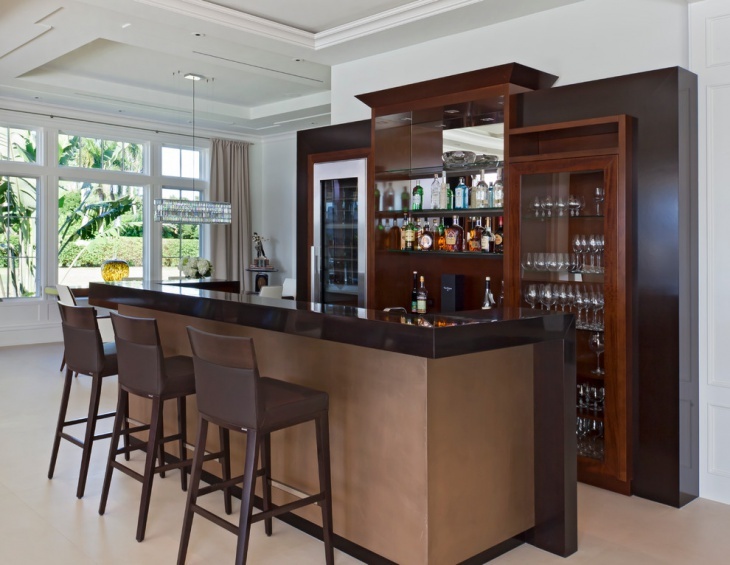 A modern home bar design is usually minimalist with the right décor to add up to the grace and functionality of the space. 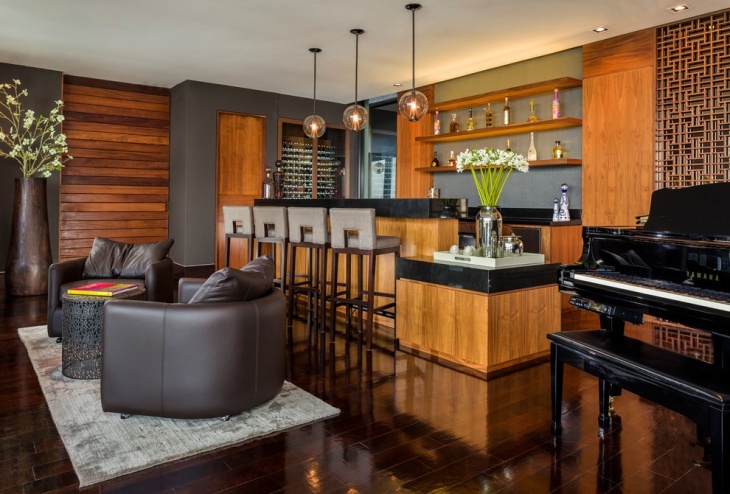 Make sure you integrate all details as per your taste which will ultimately make your home bar comfortable. 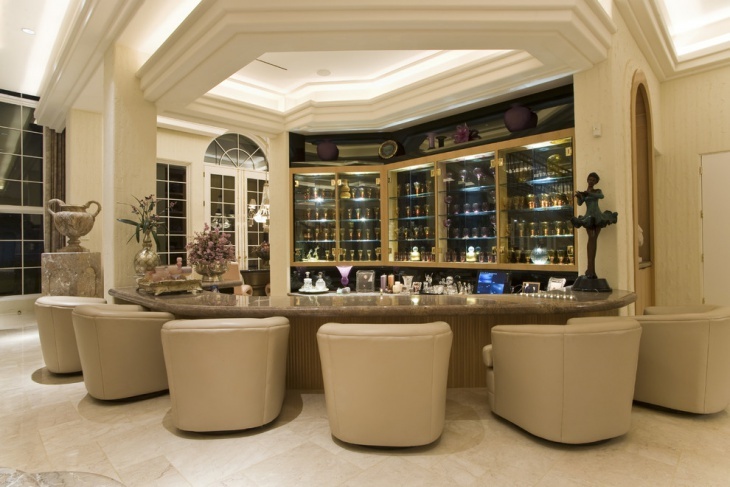 Luxury home bars are lavishly made with all the expensive décor which makes the space look opulent. 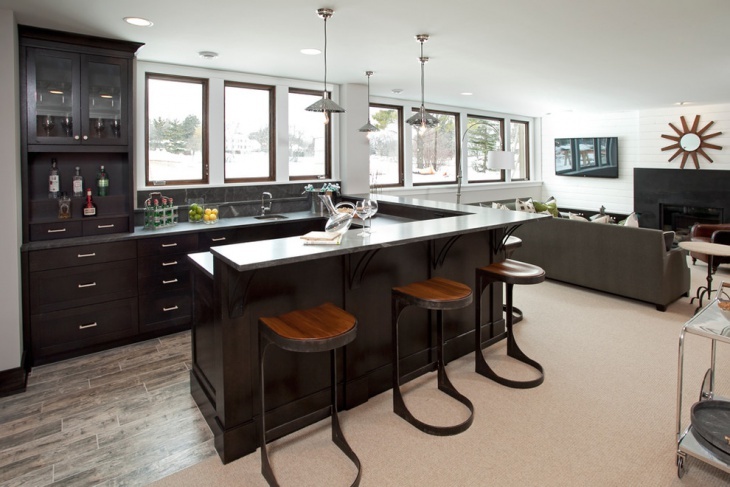 They typically consist of countertops with seats, several different varieties of drinks that are lined up perfectly in large shelves. It also features various types of lights, commonly used are the pendant lights which bring a beautiful ambiance. 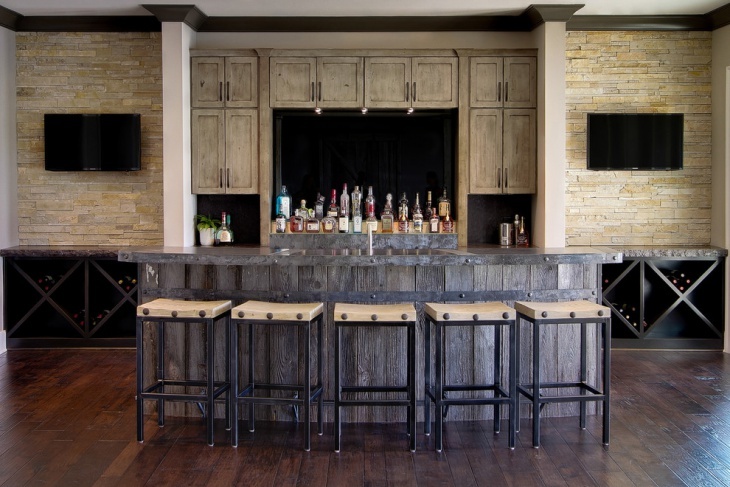 Rustic home bar designs may include stone engraved walls, antique decors and vintage finish that will create a rustic charm in the bar. 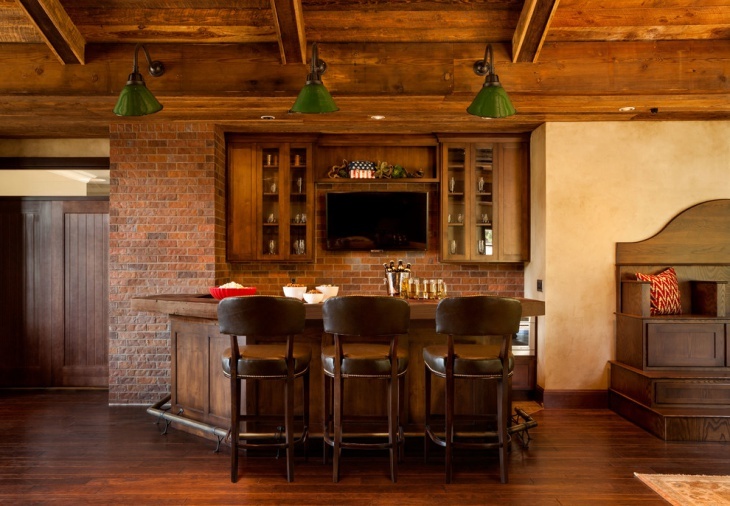 The countertops are generally made of wooden along with wood flooring in dark colors in rustic home bar designs. 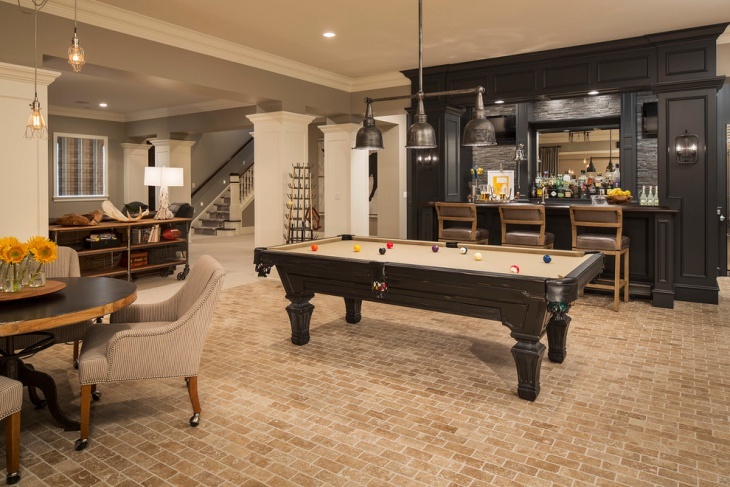 Bars are generally located inside the basement area and there are several designs including compact home bar, game room bar, miniature home bar and hidden home bar. 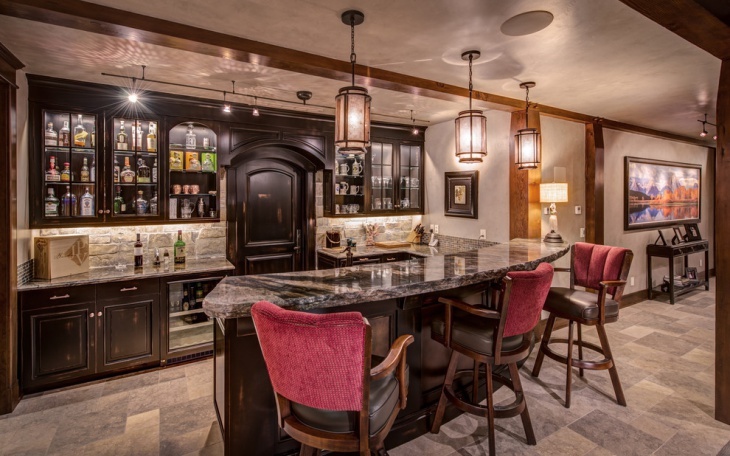 Basements are dark and mysterious and thus hidden home bars are also built in basement areas. 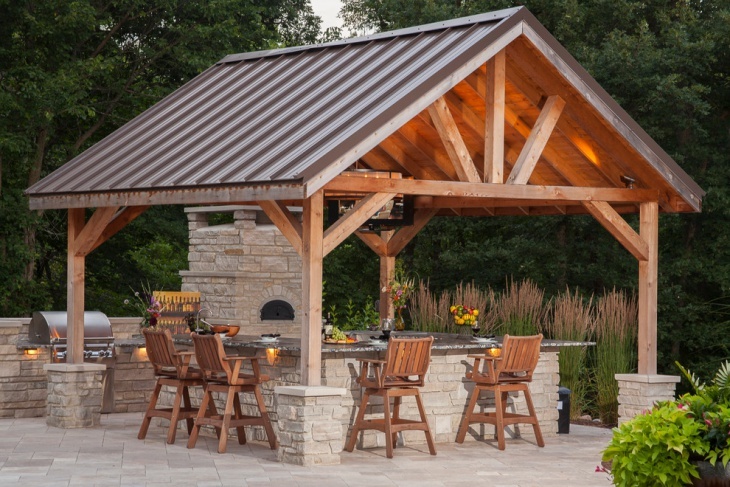 Home bars are not just meant to be inside houses, there are several home bars which are actually located at the outdoors of the house. 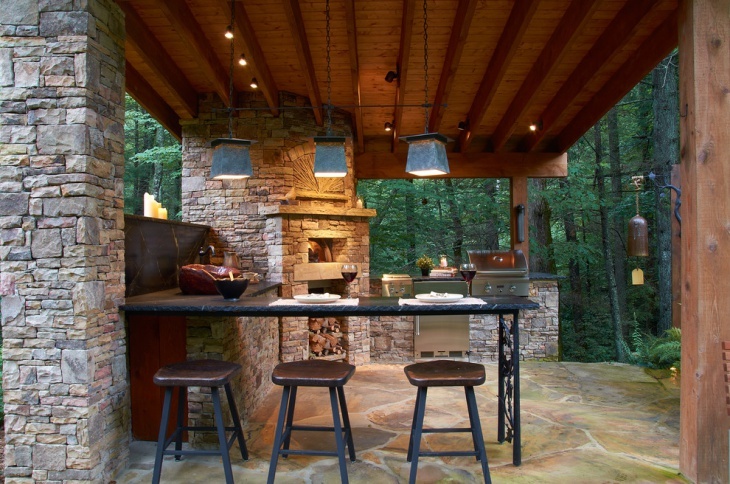 Outdoor bars can be super cool and entertaining, you could install home theaters with loudspeakers to make them more glamorous and exciting. You could also create DIY decorated tables and lights to create a colorful ambiance. 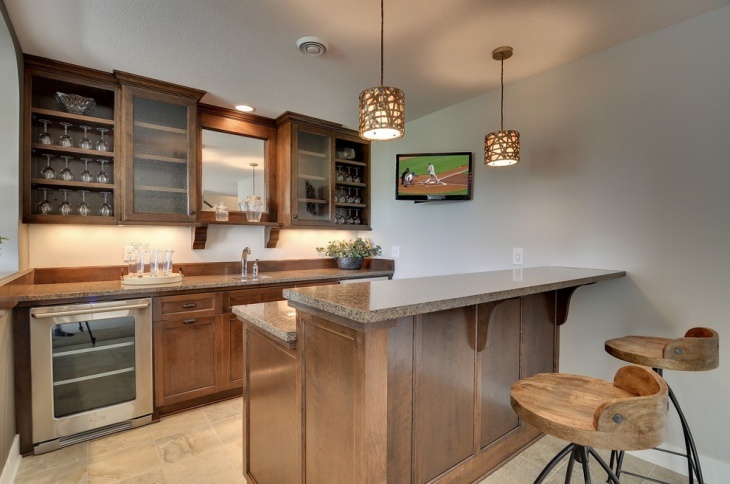 There should be a whole lot of space reserved for bars inside homes, as there is to be incorporated a lot of furniture including the cabinets and countertops. 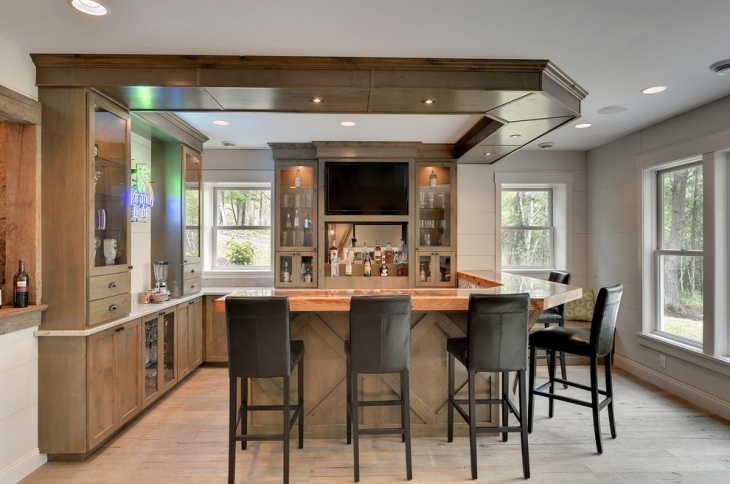 Hence, corner home bar designs offer a great idea which not only saves a lot of space but is also functional. 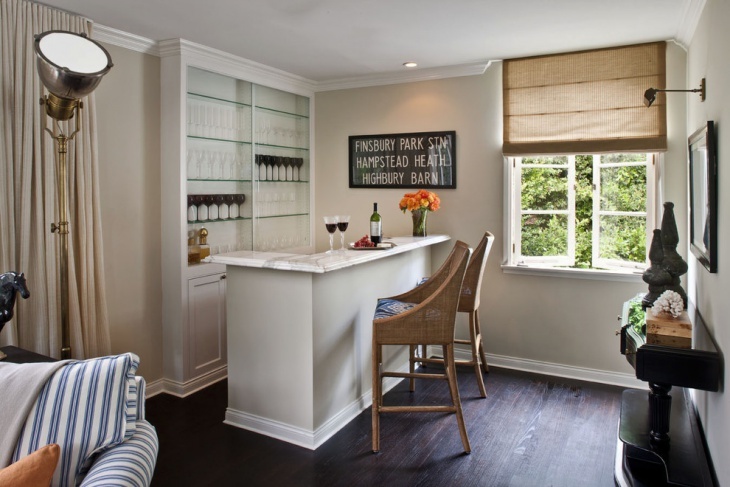 You can create an exceptionally well home bar in the corner of the space. Contemporary design is all about choosing that which is comfy, convenient and matches your personal tastes. 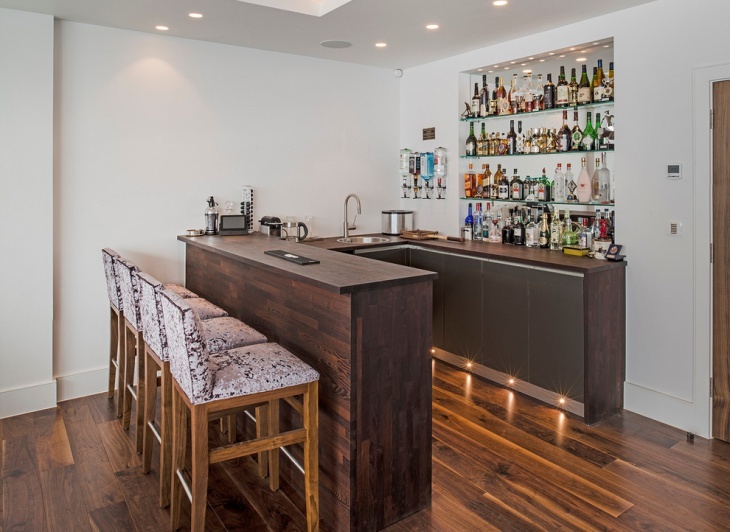 Thus creating a home bar with contemporary designs involves keeping it simple, yet having all the main ingredients required for a home bar. A contemporary design is more elegant and classy! 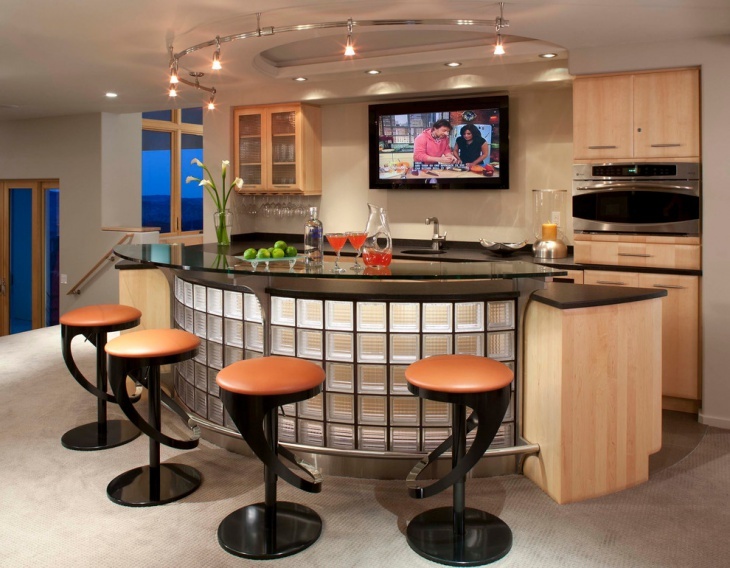 A curved home bar has a unique and exclusive design which involves having a curved countertop with seats. 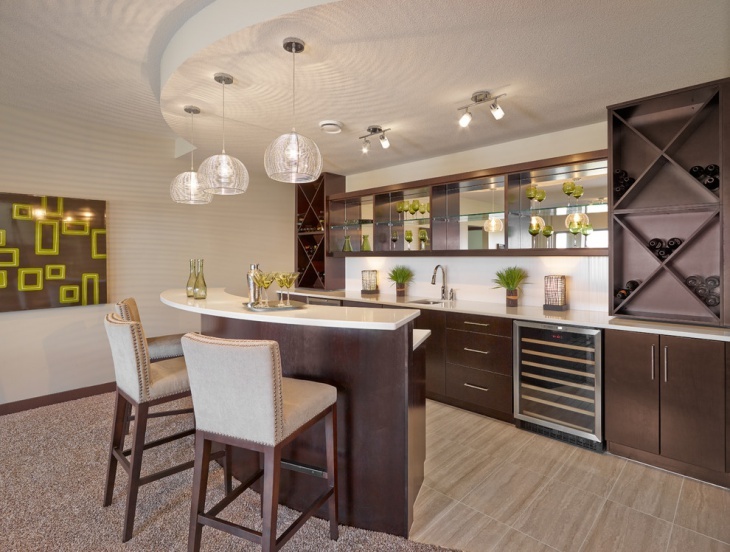 It also features cabinetry for wine bottles and has a comfortable lounge area. It also does not take up much space and is very functional and beautiful. 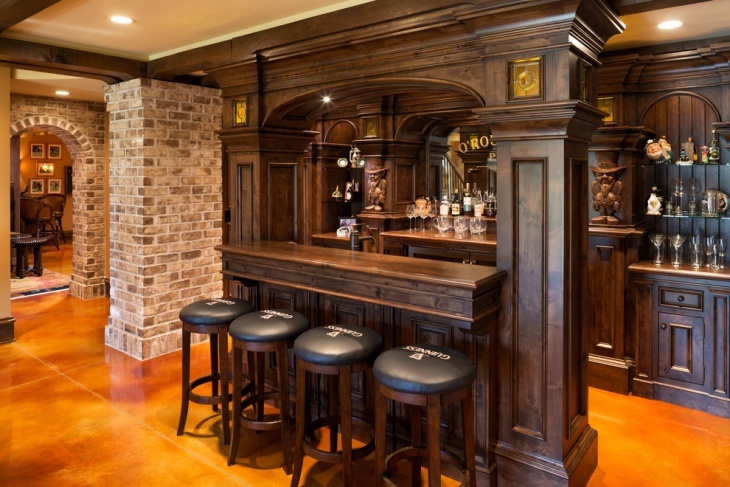 Classic home bar designs are inspired by the 80s style with typical décor. 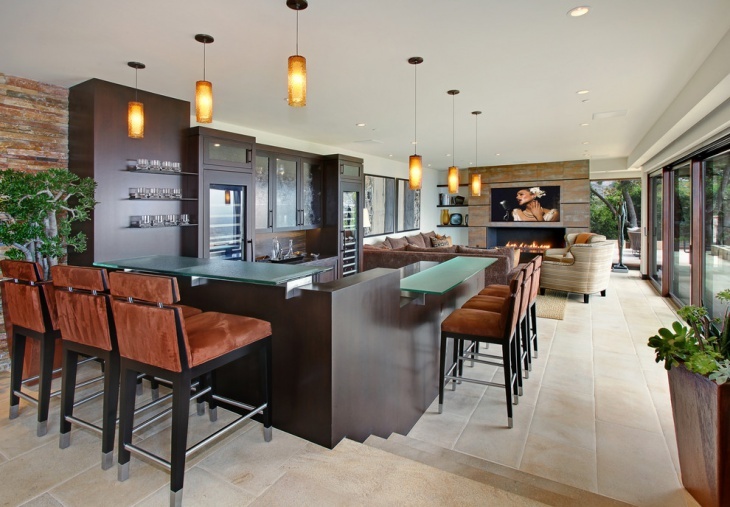 It features wooden countertops with chairs for seating and also a lounge area. It has a vintage charm and features classic décor items such as chandelier lights, vintage style glasses which may also include rustic glasses used for drinking wine. 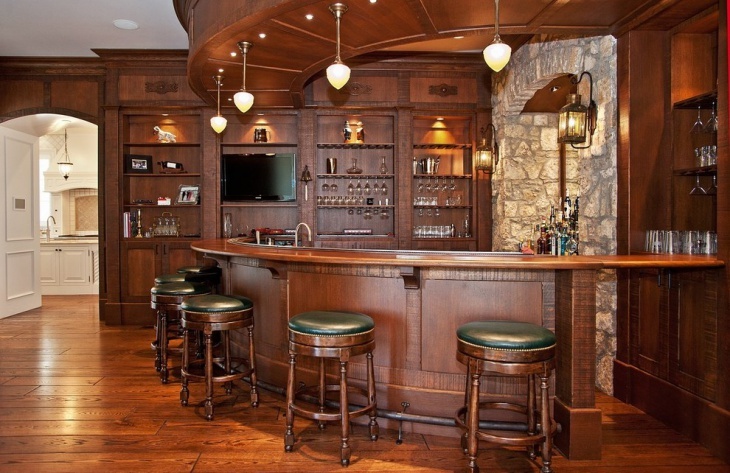 Traditional home bars have an old style interior design with wooden furniture. Dark wood furniture always holds a timeless charm with pendant lights creating a wonderful ambiance. It features leather seats fixed in large wooden chairs. The countertop can also have a granite slab or any other natural stone for a traditional look. 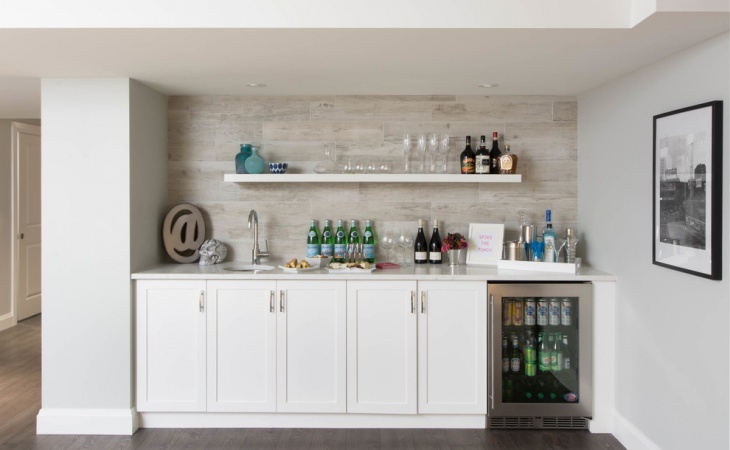 A transitional home bar can be really convenient and in most homes, it is set up right next to the kitchen as you can easily access glasses and plates from there. 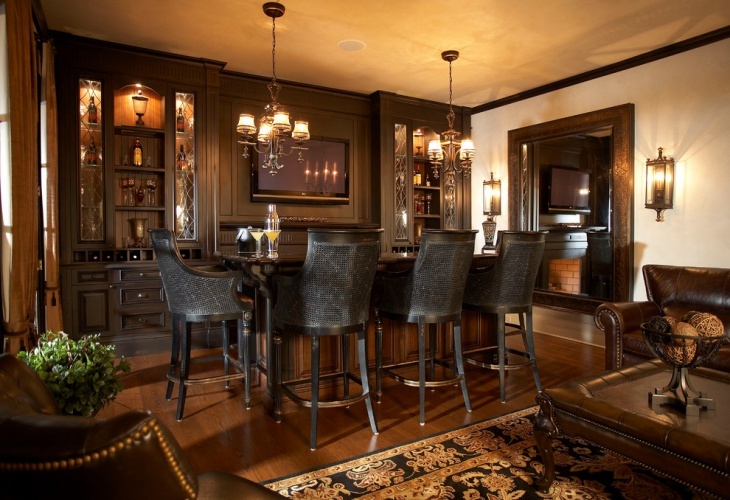 You can create a lavish transitional home bar with luxurious décor for a regal look. 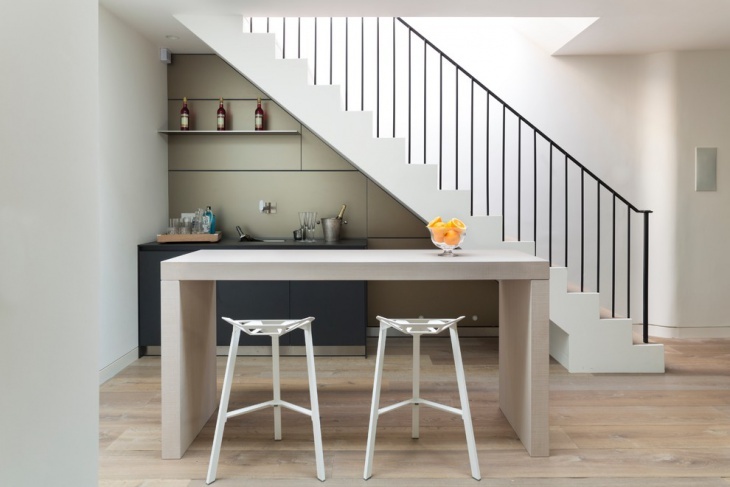 You can also create a small and compact space. 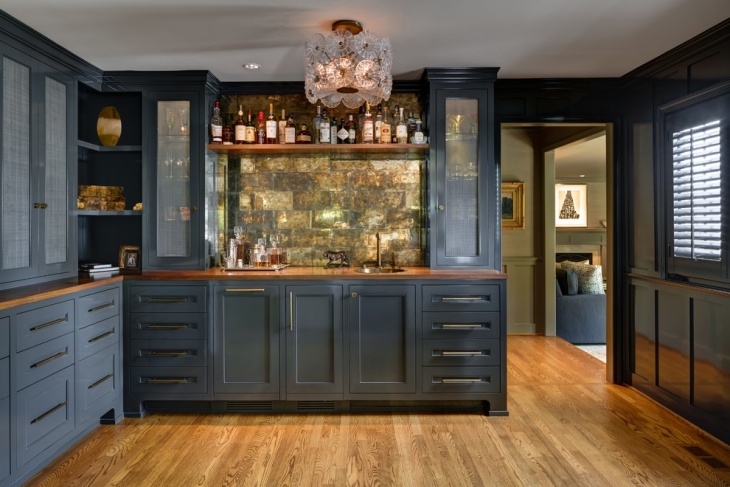 When it comes to a home bar, you certainly can experiment with your creativity. Making a DIY table with your own touch of colorful decoration is a nice idea. You can also create DIY Shelves or wallpapers to add a funky boho appeal to the space. 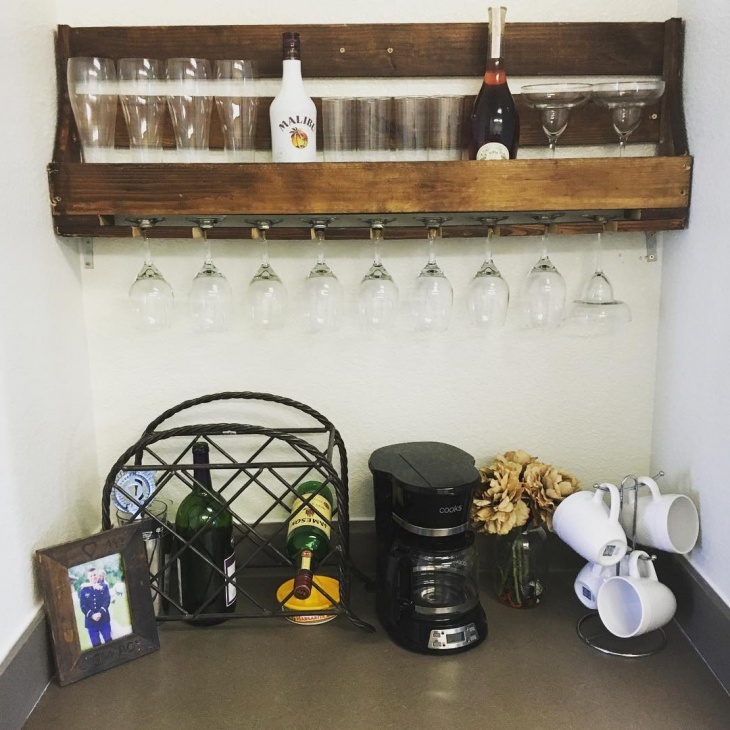 There is room for a lot of creativity in a home bar and you can make lots of DIY stuff in cheap. 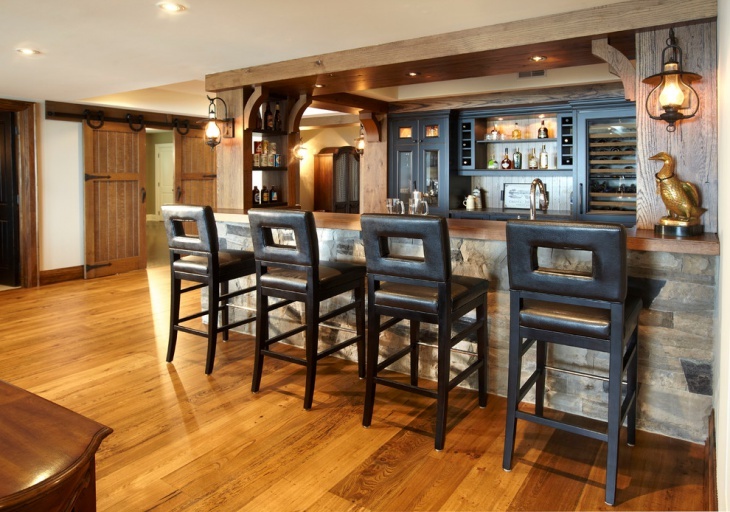 Cottages are warm, curled up and comfy and thus a cottage home bar has to be cozy, small and convenient. Make a home bar with wooden shelves and tables along with comfy chairs and add some bottles of beer to enjoy the cold weather in a cozy manner in a cottage home bar! A retro home bar design is inspired from the 80s club style and lounge and cafes. It can be full of bright lights, colorful décor, dark furniture and a lot of zing appeal. 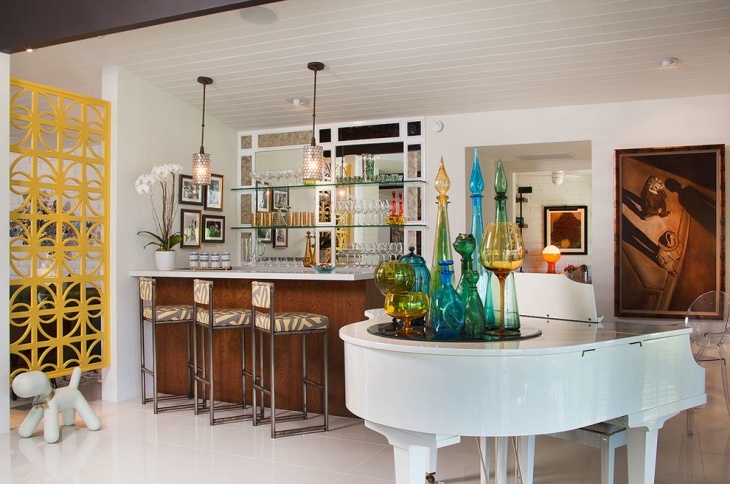 Retro home bar can be bright, vivid and colorful. 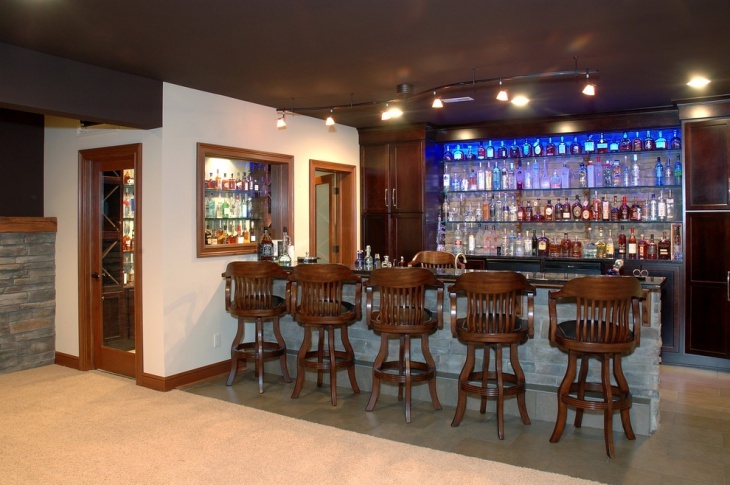 You can add pop of colors to bring out the true blue retro home bar design. Mediterranean designs have a breath of fresh air in them and designing a home bar with a Mediterranean theme is totally amazing. You can make use of earthy toned colors such as beige and brown with pops of gold to create a look of royalty. 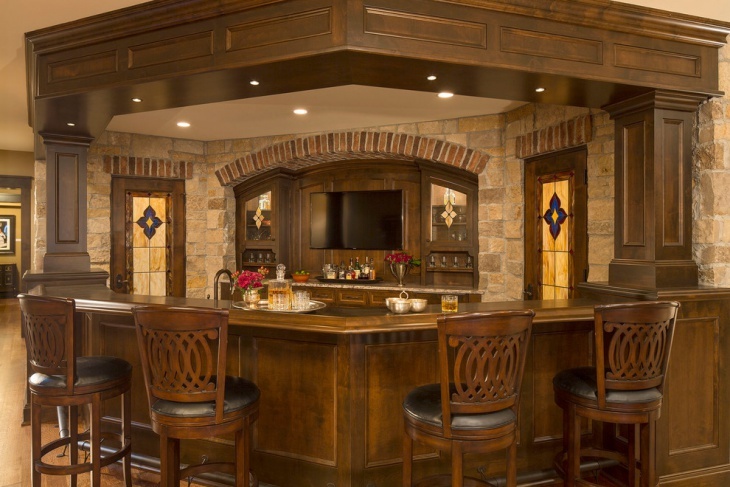 Make sure that the furniture is comfortable and functional in a Mediterranean theme home bar. Home bars made of wooden furniture are the most popular, ranging from the table, countertop, shelves etc can be of the same tone of the wood. You can also use wooden flooring to complement the décor. It looks good even with all the furniture and, the theme in wooden complementing one another in a nice way. 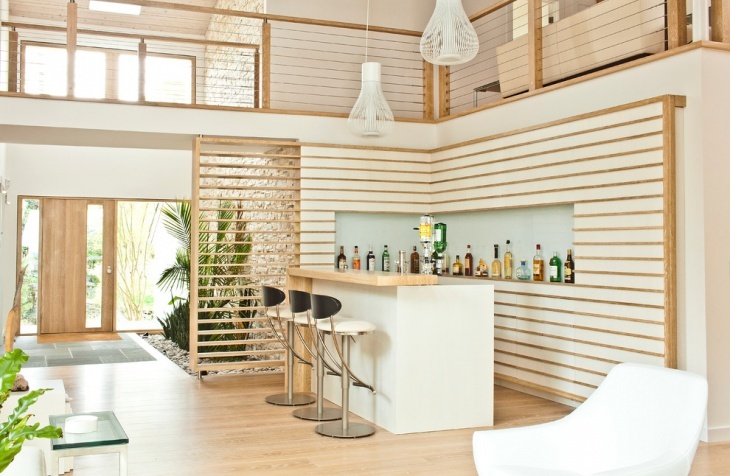 An all white home bar looks pure and serene! It makes for a great design as white color is always peaceful. Coming home after a tired day at work and sitting in the serene white ambiance of a home bar is sure let go of your stress and hard work. Victorian design is known for its timeless and elegant artistic blend. 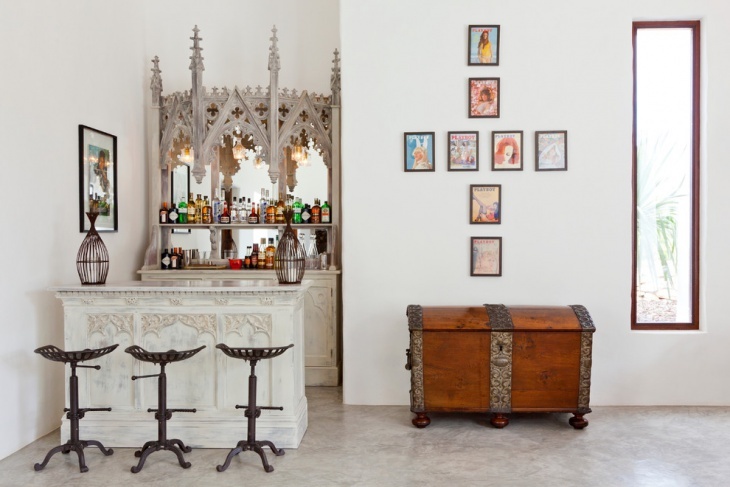 Incorporating Victorian bar design in your home can make your bar look classy. There is a unique art and design when incorporated it makes for a very beautiful design. A simple home bar design consists of the basic bar accessories and décor such as shelves, glasses and crockery, table and seats. It may also contain lights which are suited to match the décor of the house or individual preference. Home bars are places where you can play host to a great party or night outs and offer the entertainment which is available in fancy bars and pubs outside. 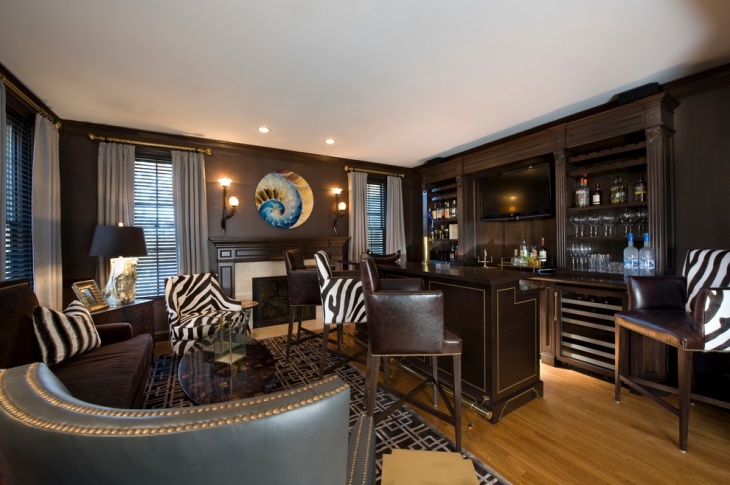 An unofficial ambiance like a home bar is not just great for negotiations with clients but also a great way to chill with friends and families. A home bar should be designed, keeping in mind the basic requirements of the space such as the table, seats, lights, glasses, shelves, etc. 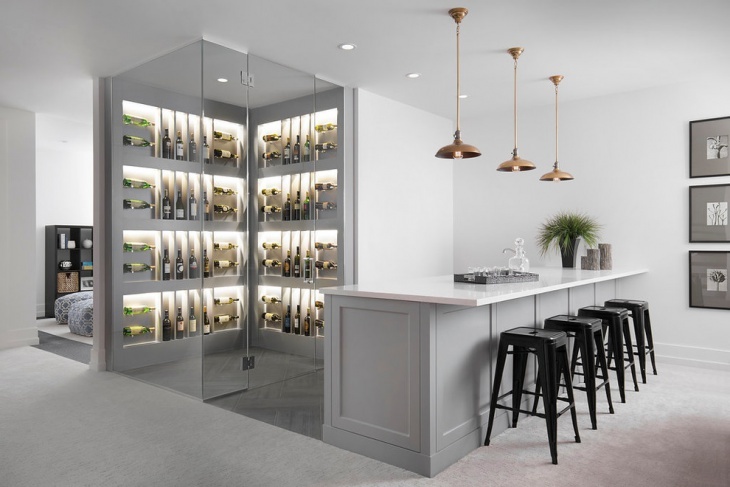 A home bar is not just convenient for you to chill with your buddies but even the most important business dealings with clients can be dealt with over a glass of wine. Make use of mood lights as lighting can totally transform the ambiance of a space, especially, that of a home bar.